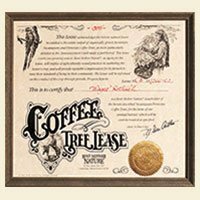 Fair Trade coffee beans from your own tree make a fun gift. In my opinion, the coffee is really better than the Starbucks breakfast blend…I’m sure Starbucks would not like to hear that! I am so excited about your website and the wonderful gift alternatives provided by Rent Mother Nature. This is now going to be one of my “go to” gift sites for adult and child birthdays and special events. My (adult) son loved his coffee lease. The coffee is GREAT, the cause is good, and the gift is fun. This is one of the greatest gifts. The coffee is the best I have ever tasted. A wonderful experience!